Given that tax day has just passed, I thought it would be good to check out some data on taxes. The IRS provides a great resource on tax data that I’ve only just gotten into. I think I’ll be able to do more with this in the future. 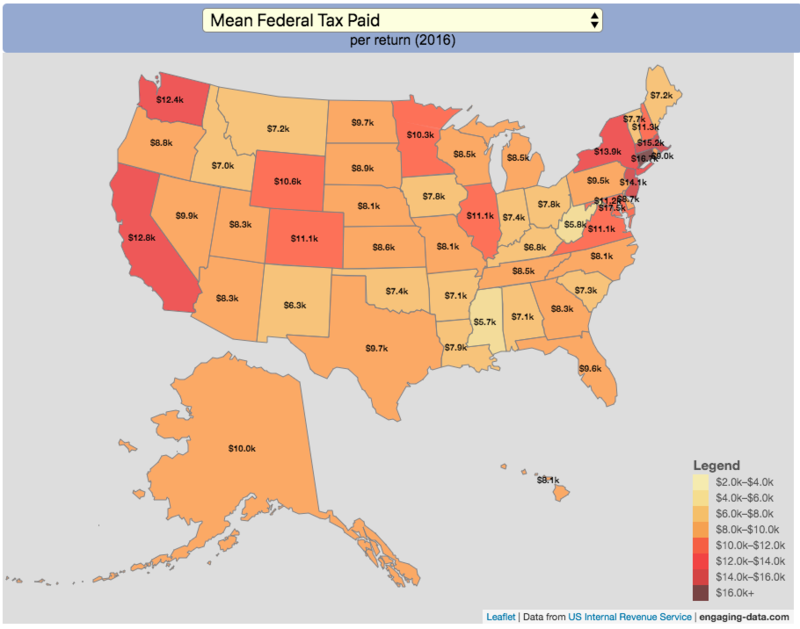 This one looks at how taxes paid varies by state and presents it as a choropleth map (coloring states based on certain categories of tax data). I may add more categories in the future, so if you have ideas of tax data you want to see visualized let me know and I’ll see what I can do. 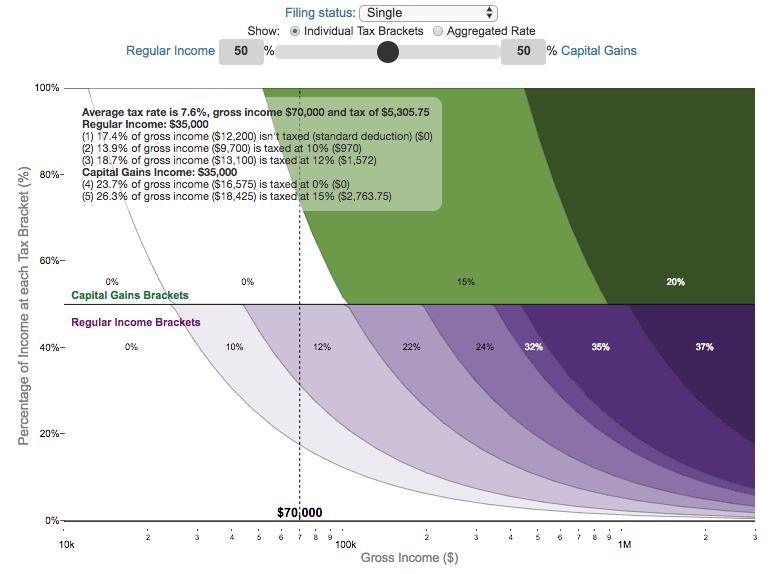 For other tax-related tools and visualizations see my tax bracket calculator and visualization of marginal tax rates. California is one of the world’s largest economies (as measured by gross domestic product), currently ranking 5th in the world (if it were judged as it’s own country). 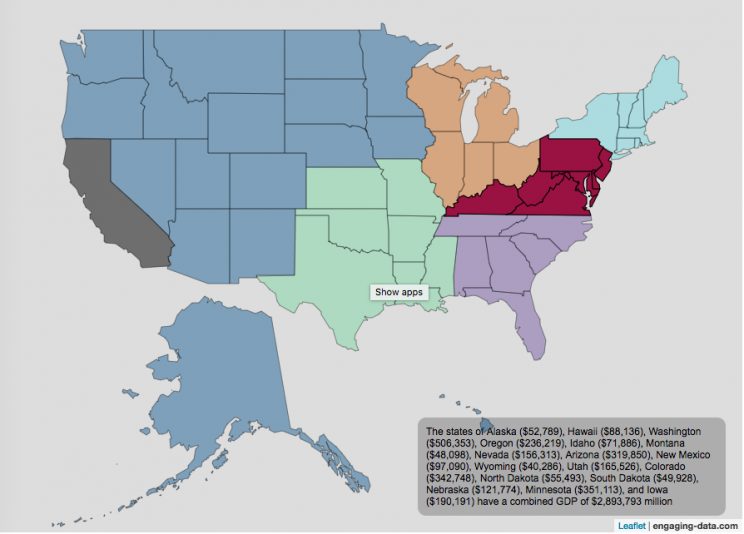 This map divides the rest of the US economy into 6 more or less equal parts (each the size of California’s) and they are all within about 10% of each other. 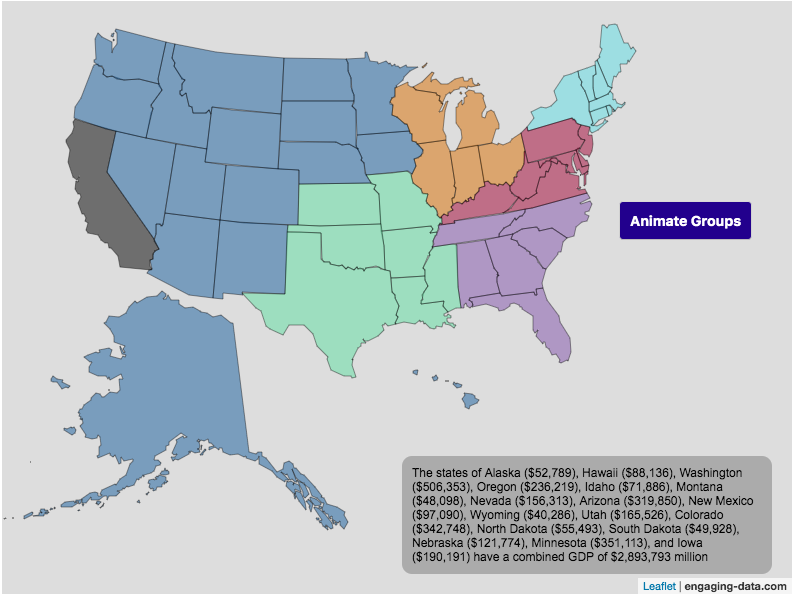 You can hover over a state with your cursor to get more information about the GDP of that state and the group of states that equal California’s economy. Gross domestic product is a measurement of the size of a region’s economy. It is the sum of gross value added from all entities in the region or state. It measures the monetary value of the goods produced and services provided in a year. The main sectors of the California economy are agriculture, technology, tourism, media (movies and TV) and trade. Some of the world’s largest and most famous companies contribute to the California economy, like Apple, Google, Facebook, Disney, and Chevron. How much do US households spend? 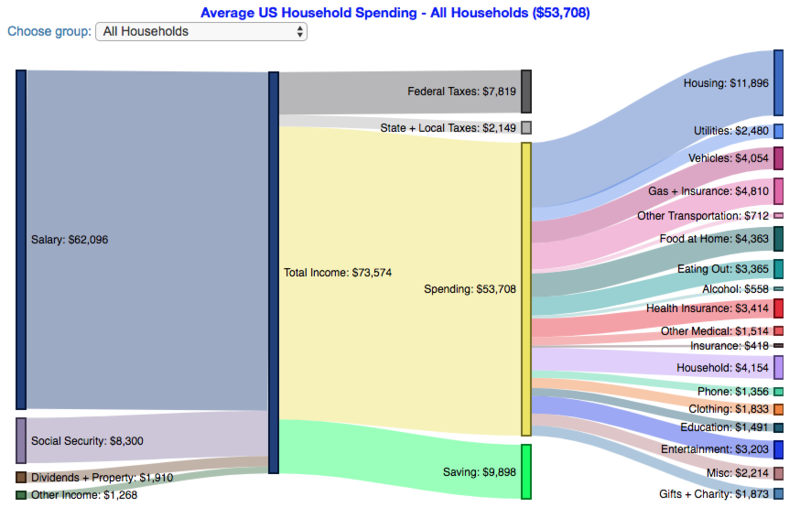 This visualization is one of a series of visualizations that present US household spending data from the US Bureau of Labor Statistics. 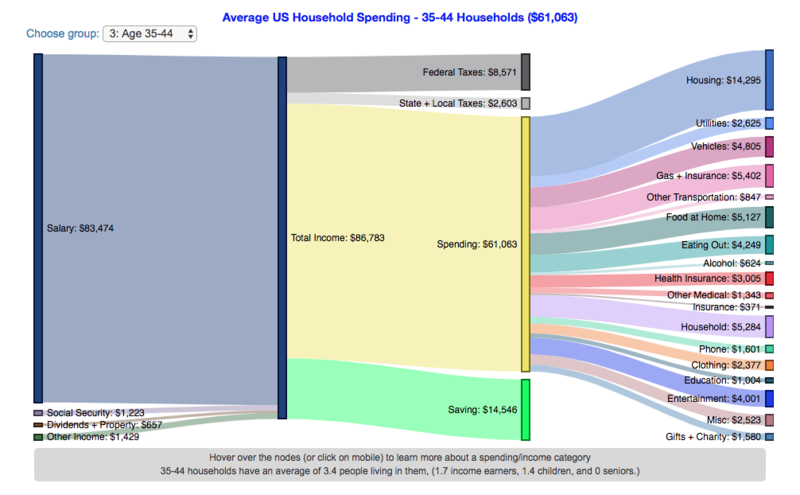 This one looks at the income of the household. Use the dropdown menu to look at averages for different groups of households based on income. This data breaks households into quintiles (groups of 20%) by income. The lowest quintile group is the group of 20% of households with the lowest income (and spend on average ~$25,500/yr). As stated before, one of the keys to financial security is spending less than your income. We can see that on average, those in the lowest quintiles may be borrowing or drawing down on savings to live their lifestyle, while those in the highest quintiles are saving money and contributing to wealth. This fairly high level of borrowing/drawing on savings from the lowest quintile households may be deceptive because it includes seniors who are drawing down savings that were built up specifically for this purpose, and college students who are borrowing to go to school. These groups generally don’t have significant incomes. How is your income distributed across tax brackets? I previously made a graphical visualization of income and marginal tax rates. That graph tried to show alot of info on the same graph, i.e. the breakdown of income tax brackets for incomes ranging from $10,000 to $3,000,000. It was nice looking, but I think several people were confused about how to read the graph. This Sankey graph is a more detailed look at the tax breakdown for one specific income. You can enter your (or any other) profile and see how taxes are distributed across the different brackets. It can help (as the other tried) to better understand marginal and average tax rates. This tool only looks at US Federal Income taxes and ignores state, local and Social Security/Medicare taxes. Enter your regular income and capital gains income. Regular income is wage or employment income and is taxed at a higher rate than capital gains income. Capital gains income is typically investment income from the sale of stocks or dividends and taxed at a lower rate than regular income. Move your cursor or click on the Sankey graph to select a specific link. This will give you more information about how income in a specific tax bracket is being taxed. As seen with the marginal rates graph, there is a big difference in how regular income and capital gains are taxed. Capital gains are taxed at a lower rate and generally have larger bracket sizes. Generally, wealthier households earn a greater fraction of their income from capital gains and as a result of the lower tax rates on capital gains, these household pay a lower effective tax rate than those making an order of magnitude less in overall income. Here are two tables that lists the marginal tax brackets in the United States in 2018 that form the basis of the calculations in the calculator. 2019’s numbers are pretty similar. For those not visually inclined, here is a written description of how to apply marginal tax rates. The first thing to note is that the income shown here in the graphs is taxable income, which simply speaking is your gross income with deductions removed. The standard deduction for 2018 range from $12,000 for Single filers to $24,000 for Married filers. If you are single, all of your regular taxable income between 0 and $9,525 is taxed at a 10% rate. This means that your all of your gross income below $12,000 is not taxed and your gross income between $12,000 and $21,525 is taxed at 10%. If you have more income, you move up a marginal tax bracket. Any taxable income in excess of $9,525 but below $38,700 will be taxed at the 12% rate. It is important to note that not all of your income is taxed at the marginal rate, just the income between these amounts. Income between $38,700 and $82,500 is taxed at 24% and so on until you have income over $500,000 and are in the 37% marginal tax rate . . . Thus, different parts of your income are taxed at different rates and you can calculate an average or effective rate (which is shown in the summary table). Capital gains income complicates things slightly as it is taxed after regular income. Thus any amount of capital gains taxes you make are taxed at a rate that corresponds to starting after you regular income. If you made $100,000 in regular income, and only $100 in capital gains income, that $100 dollars would be taxed at the 15% rate and not at the 0% rate, because the $100,000 in regular income pushes you into the 2nd marginal tax bracket for capital gains (between $38,700 and $426,700).